Hey Meeps! 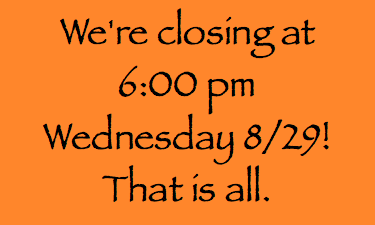 We’re closing early on Wednesday 8/29 for some much deserved R&R. We’re having a company picnic and we want everyone to be able to attend. We’re closing at 6:00 pm and will reopen Thursday morning at 11:30 am. Sorry for the inconvenience. See you on Thursday!